Many third party developers have capability to code their own modules. By defining public Toolbox docking API these developers now have the ability to develop modules which can be docked to the standard Toolbox application and to expand the functionalities of the system. The Toolbox API defines interfaces for all four types of objects, how they are created and used. By implementing this API, the docked third party module may add additional instances of these basic object types. The docked modules may be used privately by developers or disseminated to other Toolbox users. 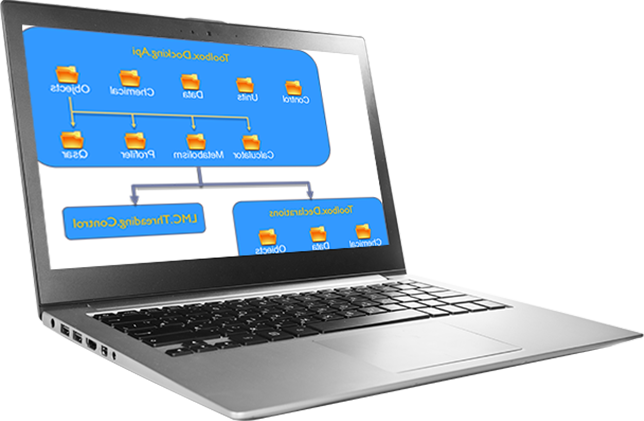 The Toolbox system consists of a client and a server application. The Toolbox API defines modules which are used by the Toolbox server application only. The modules which implement this API are used on the server side and become part of all tools available in the system. The Toolbox API is defined in project Toolbx.Docking.Api. This project refers two other declarative projects: Toolbox.Declarations and LMC.Threading.Control. To implement Toolbox API a third party module needs to refer these tree assemblies. To dock a Toolbox module add the assembly to a subfolder of Toolbox server’s Addins subfolder (e.g. “..\Toolbox Server\Bin\Addins\ThirdPartyModuleFolder\ThirdParty.dll”). Upon starting of the Toolbox server, the plugin system traverses the Addins sub-folder searching for folders containing assemblies (DLLs) that implement the IToolboxAddin interface. When such an implementation is located, the system collects object factories in internal structures for subsequent usage. 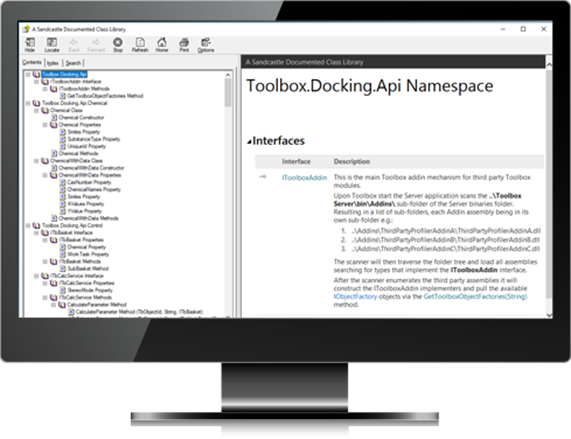 The full description of Toolbox docking API is provided in searchable help file. 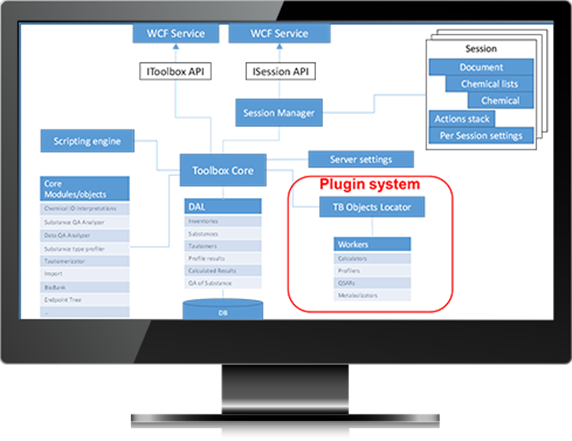 To help third party developers to develop their own Toolbox plugins an example plugin project is developed. The project defines dummy implementation of all four basic types. The purpose of implementations is to display how to create docking modules. The results obtained from these implementations are not useful for any predicting purpose.